WASHINGTON – The U.S. Air Force plans to invest more than $1.2 billion over the next five years to develop a new launch system that would aim to end the Defense Department’s reliance on a Russian rocket engine, according to budget documents set to be released Feb. 9. The President’s budget request for the next fiscal year also includes about $2.1 billion in 2021 to develop follow-on systems to two of the Air Force’s crown jewels in space: the highly protected communication satellites known as the Advanced Extremely High Frequency satellites and the missile-warning satellites in the Space Based Infrared System constellation. But the spending on the new rocket shows how replacing the Russian engine has become a top priority for lawmakers as well as Defense Department and intelligence community leaders. 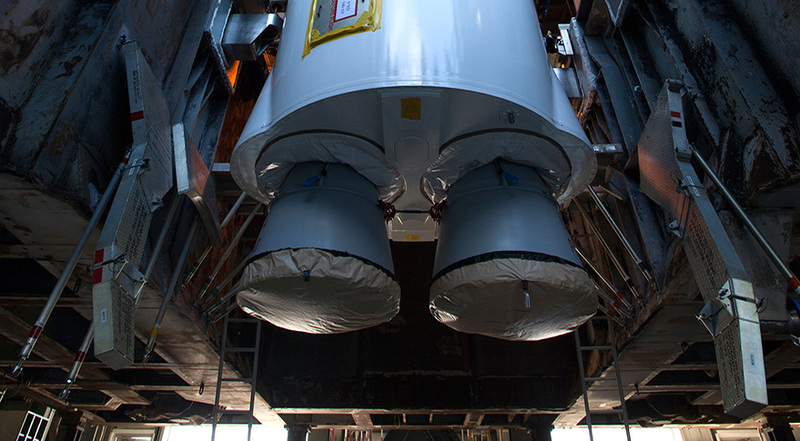 The Air Force currently depends on United Launch Alliance’s Atlas 5 rocket, which uses the Russian RD-180 engine to power its first stage, to launch the majority of national security satellites. In response to Russia’s annexation of Crimea in 2014, lawmakers have limited future use of the engine and in its place say they would like a new American engine by fiscal year 2019, a timetable Air Force officials call aggressive. In its last budget request for 2016, the Air Force had planned to spend about $208 million on a new liquid-fueled rocket engine from fiscal years 2017 to 2020, but now plans to spend more than a billion in the same time period on what’s described as an investment in a next generation launch system. Ultimately, the Air Force wants to assure it will have multiple launch providers, which could include ULA, SpaceX and Orbital ATK, for both medium- and heavy-class missions and, in the process, reap the benefits of lower costs through competition. Using a shared-investment approach, the Defense Department “intends to pursue a strategy to competitively invest in two or more domestic launch providers’ development of new launch systems or upgrades to existing systems,” the budget request said. The Air Force’s 2017 request also reveals the service’s plans for what comes next in regards to SBIRS and AEHF programs. The majority of the current generation of satellites in both programs has launched and the remaining satellites are already in production. For missile warning, the Air Force plans to begin a new development program called Evolved SBIRS in fiscal year 2018. The service would finalize program requirements following a long-term Air Force study known as an analysis of alternative and plan risk-reduction activities that could lead to an eventual competition within industry for the SBIRS payload. The Air Force requested nearly $800 million for the program in 2021. For protected communication, the Air Force has started work on a program known as Evolved AEHF, or E-AEHF. The service plans to begin risk reduction efforts in 2017 and continue develop an acquisition strategy on the program, the Air Force said. The service requested $827 million in 2020 and $1.3 billion in 2021 for the effort. The budget request did not include details on how many satellites either program would entail. The White House’s request also asks for about $1 billion over the next five years to develop the ground system for the next-generation GPS satellites, known as the Operational Control Segment, or OCX. That’s about $400 million more than officials had expected to spend a year ago. Raytheon is the prime contractor on the program and the program has faced continuing technical difficulties, including at least two additional years of work, Air Force officials said in December. Now, Pentagon officials expect to spend about $1 billion on the program from fiscal year 2017 through fiscal year 2020. That’s about $417 million more than the service expected to spend during the same time frame a year ago. An April report from the U.S. Government Accountability Office said the OCX program’s cost ultimately would exceed $2 billion. The Air Force is currently calculating a new cost estimate, which could be available as early as this month. The Air Force’s request also delays the purchase of the 11th GPS 3 satellite, expected to cost about $215 million. The service had planned, as recently as last year, to purchase that satellite in fiscal year 2017. But now, the Air Force intends to hold a competition for the next batch of GPS beginning with the 11th satellite.